Sadly we hear so often of dogs and cats being lost or stolen. This is due in part to the pet insurance that most owners now hold that provides a reward for the safe return of their beloved pet. Thieves now steal and hold the pets to ransom, holding out for a high reward from the desperate owners. Never leave your pet alone in the car. Not only is this dangerous as the car can quickly overheat and kill the animal but thieves will spot him and take the opportunity to steal him. If it means going for lunch in shifts so that the pet is never left then so be it. Perhaps a picnic is a better idea when travelling with a pet. It could be that you are involved in an accident and your cat or dog escapes from the vehicle. Do not go running along the motorway looking for him, wait for the police to arrive and alert them of the lost pet. It's a good idea to leave a card where it can be easily seen to alert emergency services how many pets were in the car and if you have left any at home - just in case you are injured and not able to speak at the time. Your pets should be wearing a collar that gives details of their ownership and ideally be micro chipped as well. This will help recover them quicker if they should be lost. When a pet is lost or stolen you should report the matter to the police as soon as possible. They will issue you with a case number that you can use for all insurance claims and follow up calls. 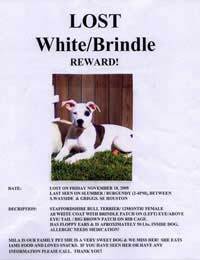 There are several countrywide groups that can help you find your dog if it is lost. Doglost is a voluntary online organisation that alerts all members in the area where the pet is lost and they help by putting up posters and helping with searches for pets. These people will also help you alert the press and other media to the fact your pet was lost or stolen. They have a good recovery rate and do not earn a penny from their good work. One of the most helpful aids when looking for your lost or stolen pet is a supply of good clear photographs, these can be used to reproduce posters that can be put up throughout the area he was last seen. Make a habit of always taking photos of your pet as he grows. Take side views, head and face shots and also any unusual marks or scars. It can happen that your pet is lost or stolen while being transported by a courier or shipping company. Follow the same routes as above but make sure that the company is doing all they can to locate your pet. In the unfortunate situation of your pet not being found the company should recompense you for your loss. It is very distressing to lose or have a pet stolen but if you plan ahead in case it should happen you will be ahead of the game when it comes to finding him. Who do you turn to when a beloved pet goes missing? We recently moved from Africa to the UK, and brought our 3 dogs and domestic cat with us via a "industry leading" pet transport agent.We were aware that there was a 6 month quarantine period, so were geared to go and visit all our pets after we had arrived in the UK. The day we were leaving, we got a phone call from the quarantine kennels (who by the way were absolutely brilliant) to ask if the pet carrier had contacted us with regard to the fact that our cat had not made it to the UK. The UK pet receivers at Heathrow had grounded the aircraft for three hours in order to locate our cat, but had not turned up anything. They came to the conclusion that our cat never actually boarded the flight, and were convinced that she was still in Africa. We contacted the pet travel company, who denied any wrongdoing as well as sent us a snotty lawyers letter threatening to take us to court if we dared to mention their name or implicate them in any wrongdoing whatsoever. We then contacted the Airline responsible for transporting the pets, they were just as adamant that it had nothing to do with them. They just loaded the crates, and were not sure if the cat had been in her crate or not?It has been a year now, and there is still no sign of our cat, even though she has a microchip and is quite unique in that she has a limp on her front paw. My family paid a large sum of money over to the "Pet travel agent" and have never even been offered condolences or our money back in travel costs for the loss of our cat. Unfortunately I do not have endless money, so cannot keep going backwards and forwards without getting any answers, and their threats of suing us for slander etc. just anger me, as we have it on good authority that our poor lovable cat, HUNNY, never even made it onto the plane!!! What does a person do in this situation, as the company involved has been doing this for a while, and have obviously got insurance against this kind of thing, but prefer to completely ignore the most important part of the contract, this being " the safe and stress free" way in which our pets would have been cared for and transported.